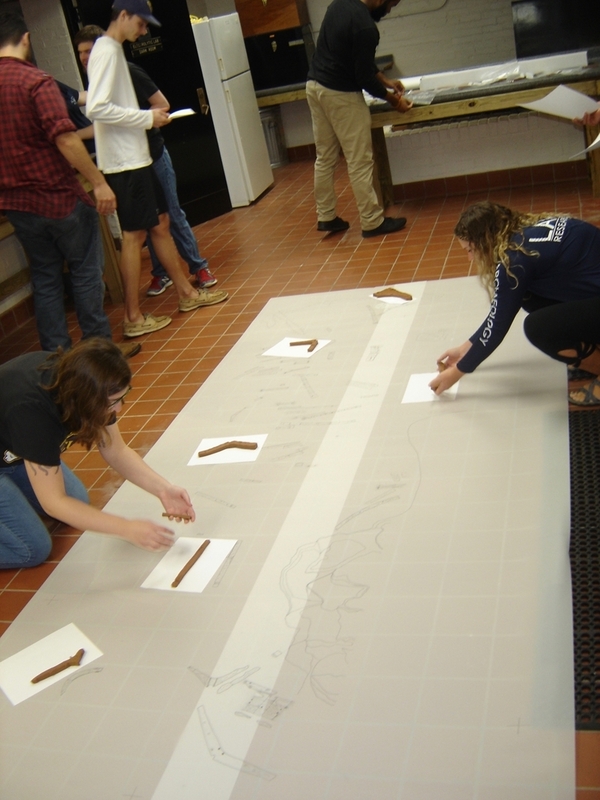 East Carolina University archaeologists working in partnership with the National Museum of Bermuda [NMB] said that they may be one step closer to linking an unidentified shipwreck site to the nearly 400–year-old story of a stranded Dutch privateer or pirate ship. The wooden sailing ship, described by the fifth Bermuda Governor Nathaniel Butler as a Dutch pinnace traveling from the Caribbean, reportedly grounded on the rocks of Bermuda’s western reef in 1619. Islanders rescued the Dutch and English crew of down-on-their-luck buccaneers, and they were repatriated within a year; the ship itself was reportedly left to wind and weather, disappearing with the next Atlantic-borne storm. 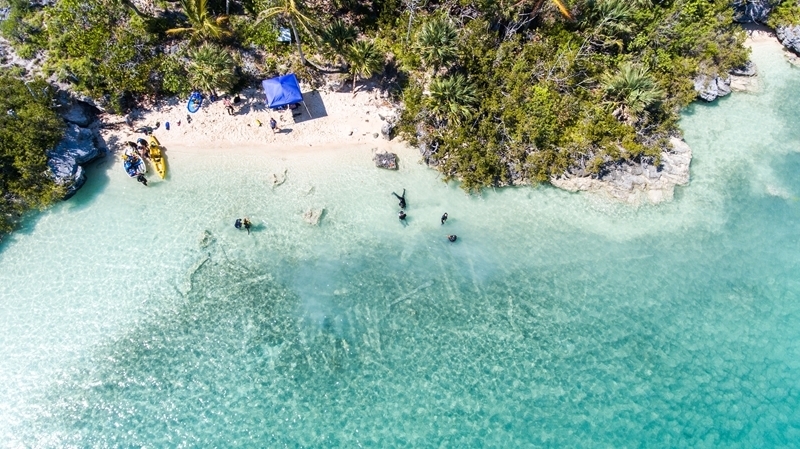 The wreck site may represent one of the earliest colonial-built, Dutch vessels discovered in the Americas, and the earliest and perhaps only fully archaeologically documented privateer/pirate vessel, according to Dr. Bradley Rodgers, ECU professor of maritime studies. Combined historical and archaeological studies will continue and could reveal new details about life in the 17th century, wrecking practices and the early settlement period in Bermuda. In 2008, Dr Rodgers examined a wreck located in a quiet harbor at the west end of the island, a short distance from the Dutch pinnace’s last known position on the reef. He recognized the wreck to be an early and significant vessel type. In May 2017, DR Rodgers returned with a team from ECU, and along with NMB, mounted the first scientific exploration of the site, archaeologically examining, mapping and recording the exposed sections of the wreck. 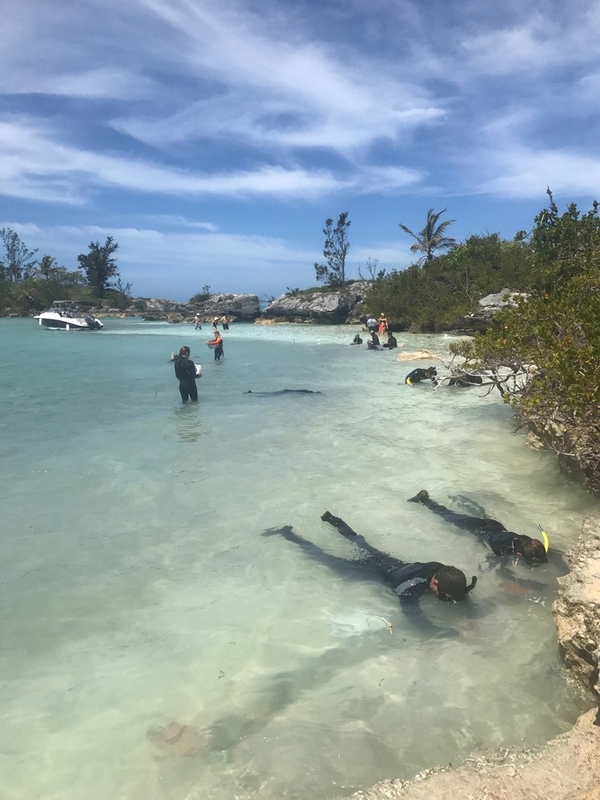 ECU maritime studies professor Dr Bradley Rodgers and a team of students have mounted the first scientific exploration of an unidentified shipwreck site in Bermuda. The remains are well known to locals, but their origins are not. “The ship remains appear to be early and significant, and archaeological evidence demonstrates unmistakable traits of northern Dutch design, techniques that have not been used in four centuries,” Dr Rodgers said. It was not uncommon during the 17th century to salvage ships in the west end of Bermuda, he said, out of sight of customs officials in the east end, to avoid taxes or levies on the goods and materials retrieved. “Salvage marks are plentiful on the disarticulated wreck, and though many of the fasteners and planks have been removed, many of the timber remains are in great condition,” he said. However, the team has documented enough of the site to identify ship construction techniques matching those described in Dutch treatises of the 17th century. In addition, the wood has been identified as greenheart [Ocotea reodiei], a New World timber historically harvested in Dutch trading territory in South America, and the few artifacts seen reflect Dutch northern European heritage from the early 17th century. Further investigation should shed more light on life in 17th century Bermuda and its early settlement, especially pertaining to the salvage of ships in distress. “The economics and impact of salvage in the early settlement of Bermuda has not yet fully been explored by academics and can provide a fascinating window into how the first Bermudians survived on an isolated island,” said Elena Strong, NMB executive director. “Bermuda’s rich underwater cultural heritage, which is protected by law, is not only a valuable cultural tourism asset, but also comprises a tangible archive of the interaction of African, American and European cultures over five centuries,” she said. They even avoided taxes and customs back then too? This island (like many others was built on unethical practice (which is an under statement), lighting fires at night on high grounds to attract ships to run aground to loot the booty, on top of that having Africans work free for centuries. And we wonder why the gap is so big. Mate, you should get a job. Then you’ll have less time to troll and feel sorry for your “underpriviledged self” cause I’m tired of earning all “your” money. It’s exhausting showing up to WORK every day, I tell ya. That is the first I ever heard a story like that – making bonfires to lure in ships and loot them – good imagination whoever made that up. But it’s not true. We had our own pirates and privateers, and last time I checked they use boats to do their work. Also common sense tells you, our reefs stranded hundreds of ships over the centuries, and people feared landing here, even feared the isle of devils itself. So people avoided here typically. They wouldn’t act like moths to a flame and land here tempted by lights. Good grief. And it’s funny you only mentioned blacks working for free. Because reality was buddy that whites and native americans were slaves here also and worked for ‘free’. But getting lodging and food and treatment was free for all such slaves. Don’t paint some twisted portrait that serves your twisted views. Look into the history of how “Wreck Hill” got its name. He is correct about Wreck Hill, they lit fires there to lure boats in to run them aground purposefully to rob them. It was done off St. David’s head as well. Sadly, Pineal, your comments demonsrate little knowledge of (accurate) Bermudian history. You are wrong/incorrect. It is a well known, documented fact (please read the history books) that huge bonfires WERE lit on the high hills (in Southampton especially) to lure vessels coming up from the south in our direction and onto the waiting reefs. And once they hit the reefs……the rest is history – the Bermudian Pirates, etc. were waiting. The vessels were sitting ducks stuck on the reefs. It IS true. Where do you think part of the ancient fear of the island (The Isle of Devils) came from? The noises made by the various “exotic” birds, the countless wild hogs that were absolutely everywhere and the reefs themselves made for a terrifying reputation that meant keeping a VERY wide berth to any superstitious sailor when coming anywhere near the island. Need (physical) proof? Go examine the cliffs and rocks in various places along the southshore shoreline and you will see several examples of “passage ways” cut out of the rock – almost roadways – leading upward and inward from many beach areas. The pirates landed their boats on those beaches and brought their hawls of “cargo” from the stranded vessels. These same passageways were used for whaling purposes also – the whales were killed and beached and cut up on the beach and the blubber and various parts, etc, etc, were carried up these passge ways. All there still today for you to see. I live near the water and know of several examples of these passageways on the south shore. Nice to see someone would take the effort to educate those who are too ignorant to do their own study. I guess he’s one off those who believe that the pyramids were built by aliens or Jewish slaves. As Martin Luther King quoted, the two most dangerous things are Sincere Ignorance and Conscientious Stupidity. Unfortunatly Pineal Gland (which is in dormant mode now) suffers from both. You’re criticizing others for their ignorance and stupidity? Seems like someone cant handle History. But he doesn’t sit on a wall. He got his vote buying raise from us tax payers a few month’s ago . The Truth is an offence, but not a sin. The truth is that you’re a wall sitting bigot. Troll on fermented onion juice. With that said, it could’ve been a slave ship. And it probably wasn’t . And Irish were accepted in mainstream society, unlike African descendants. You’re still referencing things that are 400 years old . You love doing that , eh ?